– a working session drawing on the experience and knowledge of the participants. We will experiment with muscle wire/shape memory alloys (SMA) in textiles. Soft Technology is initiated by Hillevi Munthe and is a collaboration between Atelier Nord and ”Future Textiles” at Bergen National Academy of the Arts. 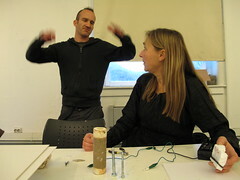 The project is funded by The Arts Council of Norway, Nordic Culture Fund and Norwegian Association for Arts and Crafts. Drawing on the experience and knowledge of the group, we will test the possibilities and limits of the SMA, experimenting with power supply, shapes and structures and effects in different textile material, using Lilypads, Arduinos and more. Based on previous experiences and experiments that Hillevi has had with using muscle wires (nitinol), the workshop starts with a talk about unknown variants that can affect the behaviour of annealed (prepared for shape shifting by heating) muscle wires. When unannealed (not shaped) the wire has a 3-5% shape shifting ability. 1. Temperature: muscle wires should be heated to 540° C. When reaching this temperature they must be immediately cooled. Using a gas torch to heat the wires requires observing the wire, looking for “glows” and twitches to determine whether it has reached 540 degrees. Question: how can we achieve a more accurate way of heating the wire to avoid under/over heating? 2. Power supply: voltage requirement, 0.3 volts per cm of muscle wire irrespective of diameter of wire. 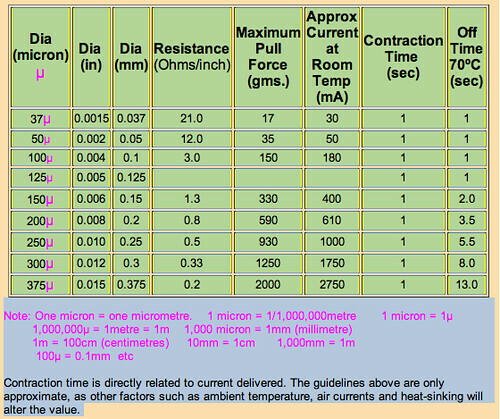 We are using this information regarding volts/watts applied to different lengths/breadths of muscle wire. Question: Experiencing “random” behaviour when applying the advised current/amp to various widths/breadths of muscle wire, what ways of testing can we find to make more precise decisions about what current to apply to different lengths/breadths of wire? So, the problem is a combination of temperature (not being able to be precise about when the wire actually reaches 540° C) when using gas torches, and electrical current. 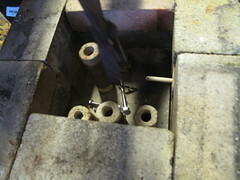 Build a small gas kiln (as used in ceramics) with a thermometer that can measure 540° C.
Make springs by coiling wire around different objects that do not melt at 540° C.
Test the annealed wires’ ability to remember their shape in boiling water instead of using an electrical current to avoid frying them. If they work, test with a lower current/amp than suggested in the table above to find the threshold for shape-shifting. Test with the values in the chart above. 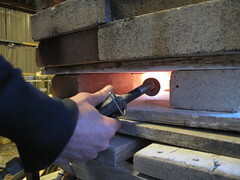 The samples were put inside and the kiln was heated to 45o° C (at which point they started to glow). All samples worked when tested in boiling water. All samples worked according to the values in the chart above when a pulsing current was sent through them. spring_01 from Amanda Steggell on Vimeo. Several more tests with heating the wire via the gas torch method. Though we got better at it, the method has a lower ration of sucess than with the kiln.